3 Beds 2 Baths 1,352 Sq. ft.
Views and more Views of the Gulf of Mexico!! 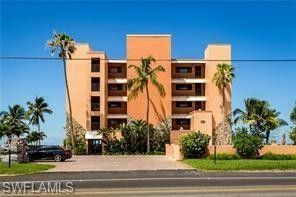 South west top floor corner unit with amazing views down to Bonita and Naples. The unit was renovated the past 3 years, repainted, new fans, new hardware, impact sliding doors, new blindsand never rented. Just a delight to show. Professional pictures will be posted beginning of next week. New furniture, new carpet and under building parking. Low density complex.